The elegantly simple Salamander Designs A5 Archetype provides plenty of storage for your A/V system. 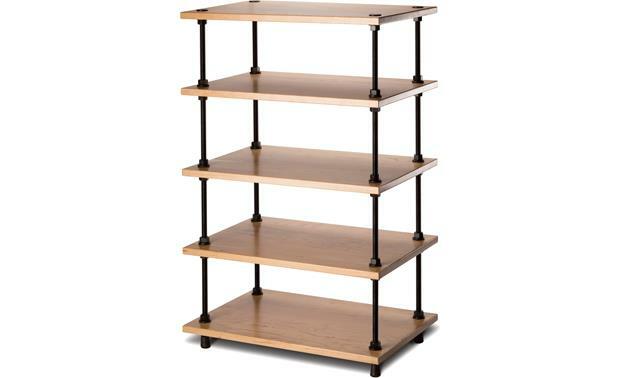 The five shelves are supported by threaded steel posts. Lug nuts hold the shelves in position, and can be adjusted to any height. 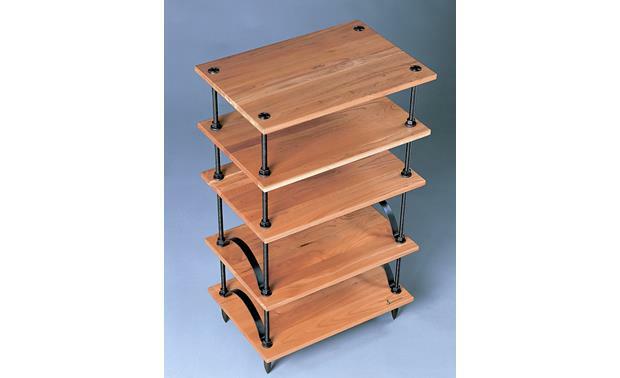 The sturdy, 3/4"-thick shelves are made of select hardwoods finished with a natural stain. 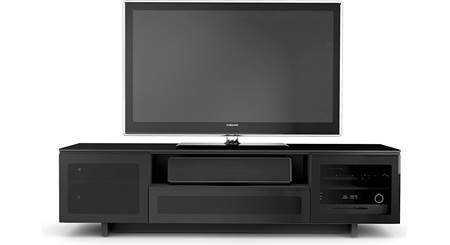 The top shelf can support a TV up to 40" and weighing up to 150 lbs. The lower shelves can also each support 150 lbs. of gear. Salamander Designs proudly manufactures its Archetype line in the U.S.A.
Are the shelves smooth wood so that a dust rag gets all the dust on one swipe? They're powder coated or something, just as easy to dust as any surface I would say. Archetype Series: Salamander's Archetype series of stands is an innovative, infinitely adjustable, modular shelving system for audio/video equipment that allows you to create a wide array of shelving possibilities. 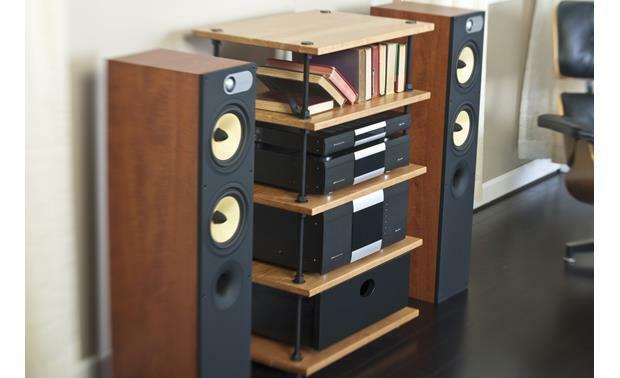 Note: Salamander's Archetype series stands are available in Black, Cherry, and Walnut finishes. Solid Construction: Salamander's Archetype series stands use solid hardwood shelves (black shelves are powder coated MDF) which are supported by full length, solid steel threaded posts (also powder coated). The wood shelves are put together using an equalization process which requires the wood panels that make up a single shelf are glued together with grains opposing one another to prevent warping. Shelves are fastened with hex nuts and metal washers in a gun metal finish and neoprene gaskets to provide resonance damping. Note: All of the Salamander Archetype series stands are hand-built in the USA. 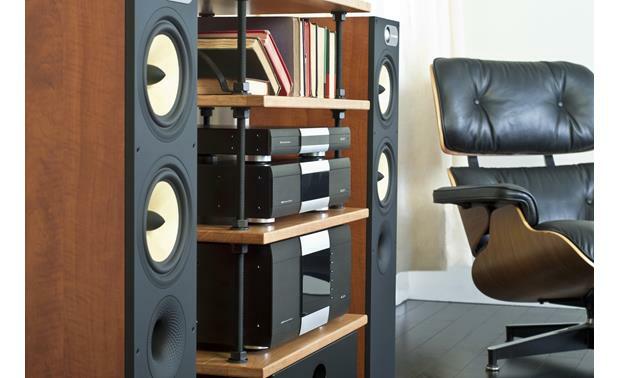 Audiophile-Grade: The Archetype series of stands was designed with the Audiophile in mind. Metal washers and neoprene gaskets sandwich shelf corners in order to isolate components. The use of dissimilar materials in it's construction further reduces resonant frequencies. Also available are MegaSpikes (537SPIKES, sold separately) to further mechanically isolate racks from environmental vibrations. Modular System: You can stack shelf units together with optional couplers (537STACK, sold separately) or add individual shelves (537SSB, sold separately) as you need them. 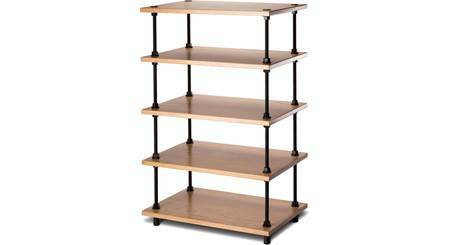 The shelf system's maximum overall height should not exceed 64". Available in 2, 3, & 5 shelf systems. 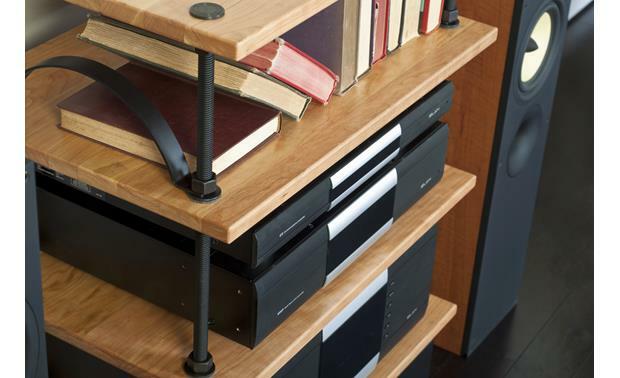 Adjustable Shelves: The Archetype series shelves are infinitely adjustable. The threaded rod allows you to adjust your shelf heights from a minimum of 1" to a maximum recommended of 20" between shelves. Each shelf measures 18.75" wide between the posts and 16" deep. Each shelf can support up to 150 lbs. Open Architecture Design: The Archetype series stands utilize an open architecture design to allow for superior component venting and simple cable management. 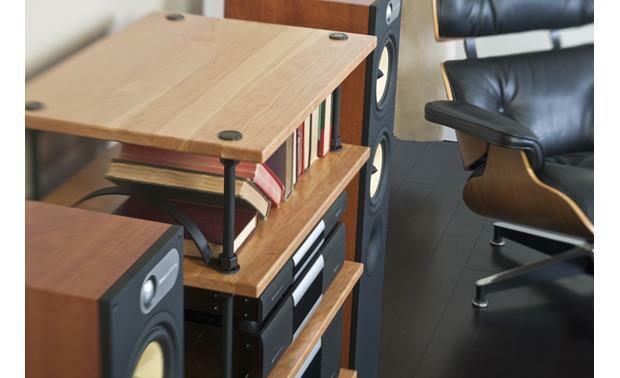 Optional Accessories: The use of optional Bookends, Drawers, and Casters (all sold separately) further enhance the stands capabilities. 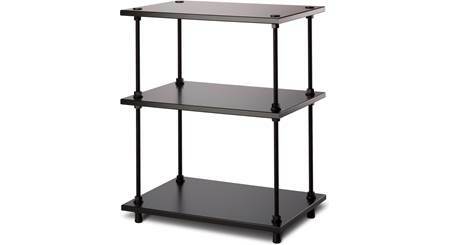 Additional Applications: In addition to holding your AV gear, these stands can be used bookshelves, end tables/side tables, night stands, computer/printer stands and any other use for open shelving. They are smooth, so yes . It's a great rack and the assembly was simple. They are laminate with fairly coarse texture, so likely takes more than one wipe. I use vacuum with brush attachment. They are very smooth, almost glossy. They wipe up very nicely! Can you adjust the shelves to different heights ? Use a tape measure and a small level . Adjust the spacing to fit your components as some need more airflow to cool them. 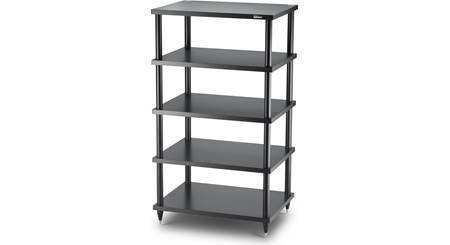 I bought this unit specifically because I can adjust the heights and even add more shelves. Not the easiest to get right the first time, but relatively quick once you get the hang of it. How can the useable space be the same as the overall dimension on the shelving ? I would say that it's not. But: if you have a component which is narrow in one of the two dimensions, the shelf will accommodate it to its full width or depth--just not both on the same shelf. In the vertical dimension, the shelves are fully adjustable, and you don't even need to install more than two shelves, so almost all of the space is available for use. I'm not quite sure what this guy wants. The shelves are adjustable,so it is pretty easy to accomidate your equipment. I'd say measure your equipment and determine if the unit can fit your equipment with room for air flow. 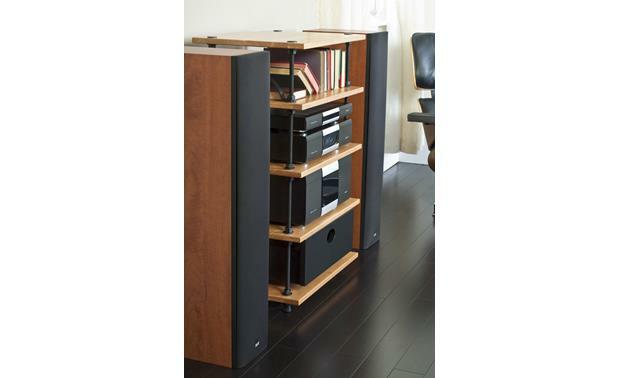 3-shelf audio stand for TVs up to 40"
Searches related to the Salamander Designs A5 Archetype 5-shelf audio/video stand for TVs up to 40".